This coming Sunday, April 14 we observe Palm Sunday. 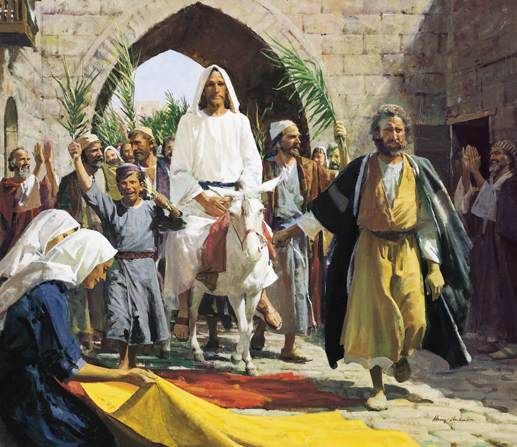 This Sunday commemorates Jesus’ “Triumphal Entry” into Jerusalem. This event was so important in Jesus’ life that all four gospels record it (Matt. 21:1-11; Mark 11:1-14; Luke 19:28-44; John 12:12-19). In each account, Jesus’ actions were portrayed as deliberate and premeditated. He sent two disciples ahead to bring back an unbroken colt on which He would ride. Matthew recorded that Jesus engineered this event to fulfill Scripture, “Rejoice greatly, O daughter of Zion! Shout in triumph, O daughter of Jerusalem! Behold, your king is coming to you; He is just and endowed with salvation, humble, and mounted on a donkey, even on a colt, the foal of a donkey” (Zech. 9:9). Instinctively, Jesus’ disciples knew what was happening. They laid their coats on the colt. Most of the crowd spread their coats on the road, their version of the “red carpet” treatment. Others were spreading palm branches on the road. As Jesus descended the Mount of Olives into Jerusalem, the crowds preceding Him were chanting, from Psalm 118:25,26, a prayer for the national salvation of Israel, “Hosanna (“Save us now”)! Blessed is He who comes in the name of the LORD.” Then they added their own words, “Blessed is the coming kingdom of our father David. Hosanna (“Save us now”) in the highest!” (Mark 11:9-10). His prophecy was terrifyingly accurate. A mere forty years later, the Roman army trapped a million Israelis inside Jerusalem at Passover, and slaughtered them mercilessly. The temple was torn down, and not a stone left standing on another. Why did God judge them? Because Israel did not crown Jesus as its King. Instead they had Him executed. Where does that leave us in 2019? I ask you, who is Jesus to you? Is he merely a good man? Merely a teacher? Merely some well-meaning, but eccentric prophet? Or have you decided to crown Jesus as your own King? Your decision is a fateful one. The Apostle John stated in blunt terms, words both comforting, yet alarming – “He who believes in the Son has eternal life; but he who does not obey the Son will not see life, but the wrath of God abides on him” (John 3:36).